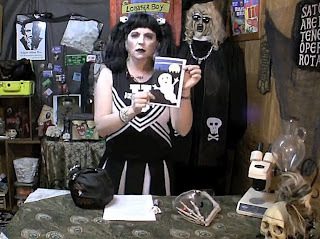 On Sally the Zombie Cheerleader's The Zombie Cheerleader Halloween Special, Sally tries to figure out what Halloween is and gets helped by Son of Ghoul, Count Gore De Vol, A. Ghastlee Ghoul, and The Pimp. 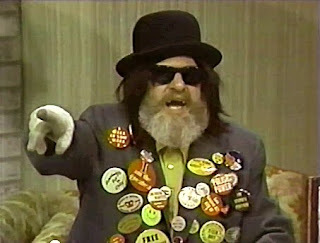 Dr. Cadaverino hosted Nightmare Theatre and Nightmare Theater on WITI Channel 6 in Milwaukee, Wisconsin from 1964 to 1977. 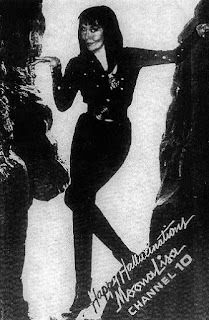 Moona Lisa was the host of a few differently named shows in the San Diego, California area. She was on the air from 1963 to 1973 on shows called Science Fiction Theatre, Fright Night, Moona Lisa's Creature Features, and Moona's Midnight Madness. De. 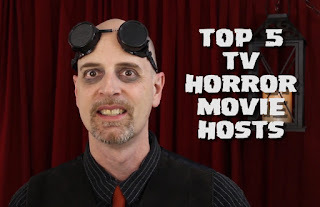 Gangrene presents his list the top five horror movie hosts.